A new update is here for Escape from Tarkov, 0.10.5, which offers some new and exciting features for the game. It also adds improvements and fixes, alongside the new features. This update also brought the complete wipe of game profiles, while preserving weapon mastering. A new map is coming soon as well, TerraGroups Labs. The encyclopedia-handbook for items already examined by the character now appears in game, and features animated food and meds consumption. This is not the final animation design, as those will be refined, and new ones will be added. Season Global Ranking is also available on the game’s website, and AI behavior was significantly improved. They became more effective and predictable opponents to deal with. This version of the game has added a Flea Market, designed to create a new economic system in the game. Flea Market is a list of items that can be sold by players, every player can try a role of a merchant now. All items are divided into categories, players can use an advanced search engine, a wish list and other convenient filters and features for easy use with the new system. 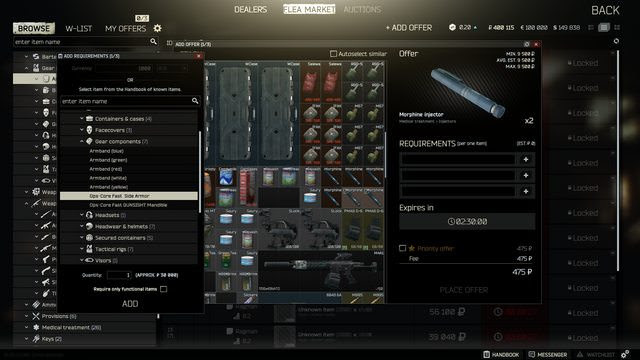 Every player can lay out any items for sale, exchange them for the items he needs, buy items from other players. As they continue to expand this concept of a real shooter, blunt damage now depends on an armor class, and bullet penetration ratio. Ergonomics are now calculated in a different way as well: mods values are added to the characteristics of the weapon that they are placed on, the skills and armor penalties are still added as a percentage. Furthermore, the final weight of the weapon influences the characteristics of the ergonomics. Aiming speed, weapon sway, alignment of the line of sight, the loudness of equipment noise when aiming depends on the characteristic of ergonomics. Finally, with new quests and quest mechanics, there were added MP7A1 SMG and new mods for Mosin rifle, as well as an ability to place players’ tags in a container in the stash.